It is the mission of the District Attorney's Office to seek and do justice by assisting law enforcement and other public agencies in the investigation of crimes, prosecuting only those crimes which can be proved beyond a reasonable doubt, ensuring a fair trial for those accused of crime as well as for victims and witnesses of crimes, advocating to the public and to the Board of Supervisors necessary improvements to the criminal justice system, and educating the public by providing prompt and accurate information regarding the activities of the office and the administration of criminal justice. Criminalists work in the District Attorney’s Forensic Laboratory conducting analysis of physical evidence, and serve as expert witnesses in court on the subjects of forensic analysis. Currently the Forensic Laboratory is seeking applicants to perform testing in forensic human-performance toxicology; including identification and quantitative methods for alcohol and drugs in blood, as well as instrumental skills in GC/MS, LC/MSMS and other related toxicological instrumentation. In addition, skills in research and validation of toxicology methods are also desirable. At entry level, Criminalists have little or no previous forensic casework experience. They receive on-the-job training in one or more of the core forensic disciplines, learning to apply the required body of knowledge. They perform fundamental, routine forensic scientific casework of moderate difficulty and within established parameters that are designed to develop broader and more in-depth knowledge and skill. This is the training and developmental level. At the journey level, Criminalists independently perform technically complex and difficult forensic scientific casework in one or more forensic disciplines; and assist in training laboratory staff and law enforcement officers. At the senior level, Criminalists perform the most technically complex, difficult, or highly sensitive scientific casework in one or more forensic disciplines; research and develop new methods and/or lead oversight and training of laboratory staff on a regular and recurring basis. Senior-level Experience: Four years of full-time directly related journey-level experience in a class comparable to Solano County's Criminalist in one of the following areas: firearms and tool mark comparisons; forensic biology/DNA, trace and impression evidence examinations, drug analysis, and/or forensic alcohol or toxicology. Note: Master's degree or higher in one of the scientific fields noted above is desirable and may be substituted for one year of the required experience. Solano County offers a cafeteria-style medical package with health benefits, offered through CalPERS. The County contribution for family coverage for the 2018 calendar year is $1,520.73 per month. The County offers a cash back provision for those who choose employee-only or who waive medical insurance coverage. The County may offer a supplemental contribution for employees enrolled in Employee plus Two or More coverage. Vacation is accrued at approximately 10 days per year for the first 3 years. Sick leave accrues at approximately 12 days per year. Employees are eligible to receive an additional 2.5% longevity pay, per level, after the completion of continuous service at 10, 20, 25, 30 and 35 years. 7/17/18 - Deadline to submit application and required documents. TBD - Tentative date for oral board examination for the most qualified applicants. Based on the information provided in the application documents, the qualified applicants may be invited for further examination and will either be pre-scheduled by the Department of Human Resources or be invited to self-schedule. All applicants meeting the minimum qualifications are not guaranteed advancement through any subsequent phase of the examination. Depending upon the number of applications received, the selection process may consist of an initial application screening, a mandatory information meeting, a supplemental questionnaire assessment, a written and/or practical exam, an oral board exam, or any combination listed. Responses to supplemental questions may be used as screening and testing mechanisms and will be used to assess an applicant’s ability to advance in the process; as such, responses to supplemental questions should be treated as test examination responses. Information contained herein does not constitute either an expressed or implied contract. A minimum score of 70% is required to continue in the selection process, unless otherwise announced. All potential new hires and employees considered for promotion to management, confidential positions or unrepresented positions will be subject to a background and reference check after contingent job offer is accepted. These provisions are subject to change. RETIREES - Solano County invites all qualified candidates to apply for positions; however pursuant to Government Code Section 21221(h) and 21224, hiring restrictions may apply to California Public Sector Pension Plan Retirees. Please visit the County of Solano website, www.jobsatsolanocounty.com, to apply. Applications must be submitted through the JobAps system. Paper copies of applications are not accepted. All additional application materials as requested in the job announcement (degree/transcripts, certificates, DD-214 if applicable, ADA Accommodation Request) must be submitted with the Document Cover Sheet, available on the employment website: http://www.jobaps.com/Solano/sup/doccover.pdf or at the Department of Human Resources’ office, and are due by the final filing date. Previously submitted application materials (e.g., copies of diploma and/or transcripts, etc.) for prior recruitments will not be applied for this recruitment but must be re-submitted for this recruitment. Any further questions can be directed to the Department of Human Resources at (707) 784-6170 or at 675 Texas Street, Suite 1800 Fairfield 94533. The office is open Monday-Friday, 8:00 a.m.-5:00 p.m. EOE/AA. A Bachelor’s Degree is required for this position. All applicants must submit a copy of their college diploma (verifying the degree, date earned and area of specialization). Applicants qualifying with a major in "a closely related physical or natural science field" must also submit official or unofficial transcripts (verifying the student, institution, courses and units completed). Candidates who fail to submit their diploma/transcripts by the final filing date will be disqualified from the recruitment. In addition to uploading attachments when applying online, candidates may submit documents in-person or by mail at Solano County Department of Human Resources 675 Texas Street, Suite 1800, Fairfield CA 94533, by fax to (707) 784-3424, or by email to recruitment@solanocounty.com When submitting documents in-person, by mail or by fax, include the recruitment title (Criminalist Journey/Senior) and the recruitment number (17-413360-01). If submitting documents by email include the recruitment title and recruitment number in the subject field. Please describe your experience in a forensic science laboratory. Please include methods of testing as well as scientific instrumentation and equipment utilized. Please describe your direct or indirect experience with laboratory accreditation and/or forensic certification. Please describe your experience providing expert court testimony and include any specialty testimony experience. Veteran applicants for initial County employment with an honorable or general under conditions discharge shall receive five (5) points added to their combined score. Disabled veterans rated at not less than 30% disability shall have ten (10) points added to their combined score. Veteran’s preference points will only be added to passing scores in competitive open examinations. APPLICANTS WITH DISABILITIES: Qualified individuals with a disability, who are able to perform the essential functions of the job, with or without reasonable accommodation, and need an accommodation during any phase of the recruitment/testing/examination process (as detailed in the “Selection Process”), must complete the following Request for Testing Accommodation by Applicants with Disabilities Form: http://www.solanocounty.com/civicax/filebank/blobdload.aspx?BlobID=23215. Click here to take a video tour of Solano County. The County of Solano offers a blend of agriculture, corporate business, cultural venues, festivals and events, and provides residents with many recreation and entertainment choices. The County is also home to Travis Air Force Base. Solano County is centrally located and serves as a gateway to all that Northern California has to offer. The Napa Valley is less than 20 miles away, two world-class public universities (UC Berkeley and UC Davis) are 20 miles away, and both San Francisco and Sacramento are less than 40 minutes away. Day trips can also be made to South Lake Tahoe and Monterey. 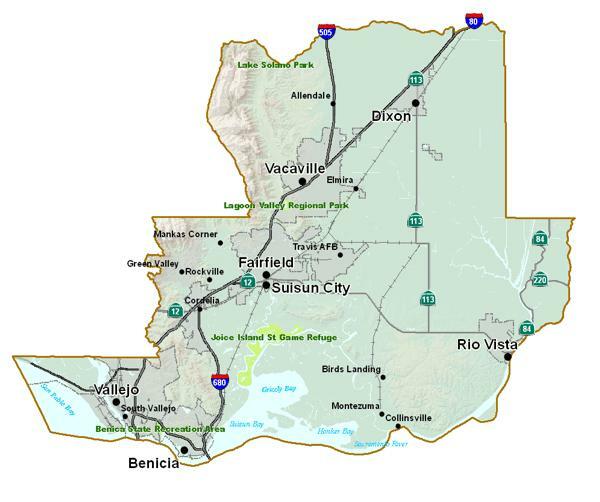 With its strategic location, affordable housing, natural resources, responsible land use planning, and attractive quality of life, Solano County is a great place to live, learn, work and play.